Independent People was a real challenge to read. Not because it was a lengthy novel, because it really wasn’t, at least for me, at 400+ pages of fine, condensed print. This is actually considered an epic by some. And it wasn’t because of the writing, which was lyrical and simply beautiful. Rather, it was because as you traipse through chapters and chapters of narrative about sheep, debt, coffee, independence, and still more sheep, you will inevitably arrive at a point when you will begin to wonder, Is there a point to the whole thing at all? But I’m not going to answer that. Instead, I will write about how I felt about Independent People – and still do. The epic novel set in Iceland is about Bjartur of Summerhouses, a stubborn and very determined sheep farmer who, after nearly two decades of servitude, has finally earned enough money to buy himself a tract of land where he intended to raise a flock of good sheep. The tract of land he has purchased was said to be inhabited by a specter from the tales of old. He builds a croft thereon, takes a bride, and starts a family. Bjartur has also made it his life’s mission to be free of debt from absolutely everyone – an independent man. "Bjartur of Summerhouses' story is the story of a man who sowed his enemy's field all his life, day and night. Such is the story of the most independent man in the country." Independent People is divided into Books One and Two. Book One is further subdivided into two parts: Icelandic Pioneers and Free of Debt, while Book Two has Hard Times, Years of Prosperity, and the Conclusion. The entire novel spans decades, as we meet Bjartur when he was all but a young sheep farmer, and the story concludes decades later, when his firstborn, Asta Sollilja, is herself a grown woman. Yes, it is a family saga infused with talk about sheep, debt, coffee, and – did I say sheep? 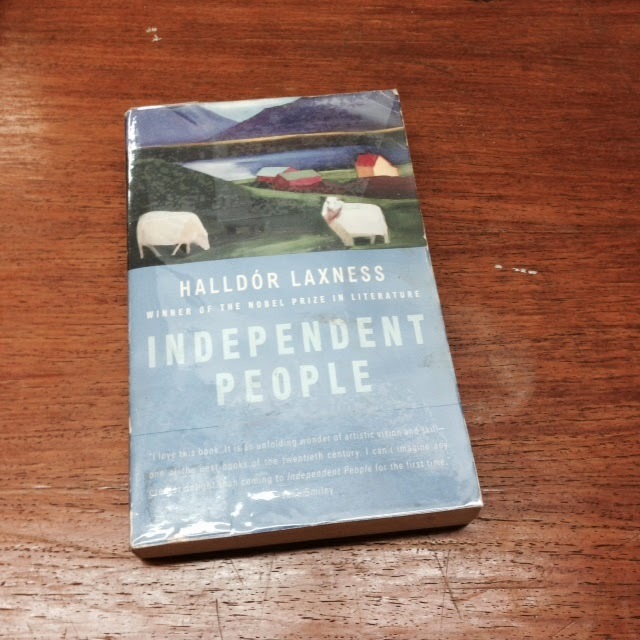 Sheep aside, however, Independent People is a powerful story of a man’s struggles for independence – from indebtedness, from ghosts, from other people, from himself. Bjartur of Summerhouses may have his flaws – he is stubborn and has a one-track mind – but no one can question his determination. Once he has set his heart and mind on something, he will move heaven and earth to earn it – without anyone’s assistance, preferably, and notwithstanding the possible perils that he may encounter as a result. Still, Bjartur succumbed to his flaws, and it stressed me to no end every time this happens. Oh, stupid, stubborn, strong-willed Bjartur! The story arc that truly resonated with me – and there were many, as may be expected from an epic novel – was the one between Bjartur and Asta Sollilja – she of the crossed eyes and the yearning, like her father, to be one of the independent people. Her mother died after giving birth to her, and she grows up on the croft with her little brothers – my favorite is little Nonni, the youngest, for her father took a seond wife, Finna – whom she looked after. She is much like Bjartur in her obstinacy, which ultimately figures in a conflict involving the two of them. The struggle between father and daughter, the truth about their bond, and the resolution of that conflict are the aspects of Independent People that affected me in a big way. Politics also played an important part in the novel. Bjartur, who had believed himself free of indebtedness and strived with all his might to maintain the status quo, had to yield to these politics because he was left with no other choice. What can you possibly do when natural causes – disease, accident, even unexplainable deaths – ravage your sole source of livelihood? Not even religion could save Bjartur’s precious sheep. Off to the political system he submitted. It is, after all, a dog-eat-dog world. Even one filled with sheep. I spent nearly a month reading this, and despite its plotlessness, I thoroughly enjoyed it. Brad Leithauser, who wrote the introduction, said that this is “the book of his life.” Independent People may not be mine, but I think I completely understand where the guy is coming from. "No lamentations - never harbour your grief, never mourn what you have lost."